This article is about the year 1789. Wikimedia Commons has media related to 1789. April 28: Mutiny on the Bounty. 1789 (MDCCLXXXIX) was a common year starting on Thursday of the Gregorian calendar and a common year starting on Monday of the Julian calendar, the 1789th year of the Common Era (CE) and Anno Domini (AD) designations, the 789th year of the 2nd millennium, the 89th year of the 18th century, and the 10th and last year of the 1780s decade. As of the start of 1789, the Gregorian calendar was 11 days ahead of the Julian calendar, which remained in localized use until 1923. January – Emmanuel Joseph Sieyès publishes the pamphlet What Is the Third Estate? (Qu'est-ce que le tiers-état? ), influential on the French Revolution. January 7 – The United States presidential election, 1788–89 and House of Representatives elections are held. January 9 – Treaty of Fort Harmar: The terms of the Treaty of Fort Stanwix (1784) and the Treaty of Fort McIntosh, between the United States Government and certain native American tribes, are reaffirmed, with some minor changes. January 21 – The first American novel, The Power of Sympathy or the Triumph of Nature Founded in Truth, is printed in Boston, Massachusetts. The anonymous author is William Hill Brown. January 23 – Georgetown University is founded in Georgetown, Maryland (today part of Washington, D.C.), as the first Roman Catholic college in the United States. April 30: First President of the United States, George Washington, elected. February – King Gustav III of Sweden enforces the Union and Security Act, delivering the coup de grace to Sweden's 70-year-old parliamentarian system, in favor of absolute monarchy. February 4 – George Washington is unanimously elected the first President of the United States, by the United States Electoral College. March – The first version of a graphic description of a slave ship (the Brookes) is issued on behalf of the English Society for Effecting the Abolition of the Slave Trade. March 4 – At Federal Hall in New York City, the 1st United States Congress meets, and declares the new United States Constitution to be in effect. The bicameral United States Congress replaces the unicameral Congress of the Confederation, as the legislature of the federal government of the United States. March 11 – The Venetian arsenal on the island of Corfu, containing 72,000 pounds (33,000 kg) of gunpowder and 600 bombshells, explodes during a fire, killing 180 bystanders and knocking down a seawall. April 1 – At Federal Hall, the United States House of Representatives attains its first quorum, and elects congressman Frederick Muhlenberg as the first Speaker of the House. April 6 – At Federal Hall, the United States Senate attains its first quorum, and elects John Langdon of Pennsylvania as its first President pro tempore. Later that day, the Senate and the House of Representatives meet in joint session for the first time, and the electoral votes of the first U.S. Presidential election are counted. General George Washington is certified as President-elect, and John Adams is certified as Vice-President elect. April 7 – Selim III (1789–1807) succeeds Abdul Hamid I (1773–1789), as Ottoman Sultan. April 21 – John Adams takes office as the first Vice President of the United States, and begins presiding over the United States Senate. 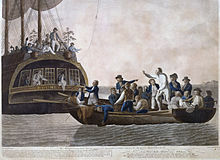 April 28 – Mutiny on the Bounty: Fletcher Christian leads the mutiny on the British Royal Navy ship HMS Bounty against Captain William Bligh, in the Pacific Ocean. April 30 – George Washington is inaugurated at Federal Hall in New York City, beginning his term as the first President of the United States. May 5 – In France, the Estates-General convenes for the first time in 175 years. June – The Inconfidência Mineira is the first attempt at Brazilian independence from Portugal. June 17 – In France, representatives of the Third Estate at the Estates-General declare themselves the National Assembly. June 20 – The Tennis Court Oath is made in Versailles. June 23 – Louis XVI of France makes a conciliatory speech urging reforms to a joint session, and orders the three estates to meet together. July – An estimated 150,000 of Paris's 600,000 people are without work. July 1 – The comic ballet La fille mal gardée, choreographed by Jean Dauberval, is first presented under the title Le ballet de la paille, at the Grand Théâtre de Bordeaux, at Bordeaux, France. At Versailles, the National Assembly reconstitutes itself as the National Constituent Assembly, and begins preparations for what will become the French Constitution of 1791. The Theatre War officially ends in Scandinavia. July – Storofsen flood in Norway. July 10 – Alexander Mackenzie reaches the Mackenzie River Delta. July 11 – Louis XVI of France dismisses popular Chief Minister Jacques Necker. July 12 – An angry Parisian crowd, inflamed by a speech from journalist Camille Desmoulins, demonstrates against the King's decision to dismiss Minister Necker. July 13 – The people begin to seize arms for the defense of Paris. 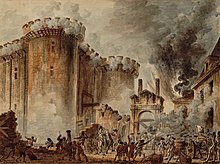 The French Revolution (1789–1799) begins with the Storming of the Bastille: Citizens of Paris storm the fortress of the Bastille, and free the only seven prisoners held. In rural areas, peasants attack manors of the nobility. Survivors of the mutiny on the Bounty, including Captain William Bligh and 18 others, reach Timor after a nearly 4,000-mile (6,400 km) journey in an open boat. July 27 – The first agency of the Federal government of the United States under the new Constitution, the Department of Foreign Affairs  (from September 15 renamed the Department of State), is established. August 4 – In France, members of the Constituent Assembly take an oath to end feudalism, and abandon their privileges. August 7 – The United States Department of War is established. August 18 – The Liège Revolution breaks out in the Prince-Bishopric of Liège. August 21 – A proposal for a Bill of Rights is adopted by the United States House of Representatives. August 26 – The Declaration of the Rights of Man and of the Citizen is proclaimed in France, by the Constituent Assembly. August 28 – William Herschel discovers Enceladus, one of Saturn's moons. September 11 – Alexander Hamilton is appointed as the first United States Secretary of the Treasury. Russo-Turkish War (1787–92) – Battle of Rymnik: Alexander Suvorov roundly defeats 100,000 Turks. September 24 – The Judiciary Act of 1789 establishes the federal judiciary, and the United States Marshals Service. September 25 – The United States Congress proposes a set of 12 amendments to the U.S. constitution, for ratification by the states. Ratification for 10 of these proposals is completed on December 5, 1791, creating the United States Bill of Rights. September 29 – The U.S. Department of War establishes the nation's first regular army, with a strength of several hundred men. October 5 – Women's March on Versailles: Some 7,000 women march 12 miles (19 km) from Paris to the royal Palace of Versailles, to demand action over high bread prices. October 10 – Physician Joseph-Ignace Guillotin proposes to the French National Assembly the adoption of more humane and egalitarian forms of capital punishment, including use of the guillotine. October 24 – Brabant Revolution: Brabant revolutionaries cross the border from the Dutch Republic into the Austrian Netherlands; the first public reading of the Manifesto of the People of Brabant declares the independence of the Austrian Netherlands. October 27 – Battle of Turnhout: The Austrian army is beaten by Brabant revolutionaries. November 6 – Pope Pius VI creates the first diocese in the United States at Baltimore, and appoints John Carroll the first Roman Catholic bishop in the United States. November 20 – New Jersey ratifies the United States Bill of Rights, the first state to do so. November 26 – A national Thanksgiving Day is observed in the United States, as recommended by President George Washington and approved by Congress. December 11 – The University of North Carolina, the oldest public university in the United States, is founded. December 23 – A leaflet circulated in France accuses the Marquis de Favras of plotting to rescue the royal family. Joseph II, Holy Roman Emperor, decrees that all peasant labor obligations be converted into cash payments. The Traité Élémentaire de Chimie (Elementary Treatise of Chemistry), an influential chemistry textbook by Antoine Lavoisier, is published; translated into English in 1790, it comes to be considered the first modern chemical textbook. German chemist Martin Heinrich Klaproth discovers the element uranium, while studying the mineral pitchblende. Properties of Évian water first discovered. The Bengal Presidency first establishes a penal colony, in the Andaman Islands. Thomas Jefferson returns from Europe, bringing the first macaroni machine to the United States. Influenced by Dr. Benjamin Rush's argument against the excessive use of alcohol, about 200 farmers in a Connecticut community form a temperance movement in the United States. Fort Washington (Cincinnati, Ohio) is built to protect early U.S. settlements in the Northwest Territory. Former slave Olaudah Equiano's autobiography The Interesting Narrative of the Life of Olaudah Equiano, one of the earliest published works by a black writer, is published in London. ^ "219 years ago - Description of a Slave Ship". Rare Book Collections @ Princeton. Princeton University Library. 2008. Archived from the original on February 4, 2014. Retrieved March 19, 2013. ^ "The Brookes - visualising the transatlantic slave trade". 1807 Commemorated. University of York Institute for the Public Understanding of the Past. 2007. Retrieved March 19, 2013. ^ "The establishment of the Department of War". clerk.house.gov. Archived from the original on March 7, 2011. ^ Adamson, Barry (2008). Freedom of Religion, the First Amendment, and the Supreme Court: How the Court Flunked History. Pelican Publishing. p. 93. ^ "The First Supreme Court". History.com. Archived from the original on May 1, 2009. Retrieved September 24, 2008. John Blair; J. Willoughby Rosse (1856). "1789". Blair's Chronological Tables. London: H.G. Bohn – via Hathi Trust.